With a concrete color-magnitude diagram to work with, you can then shift your cluster onto the absolute magnitude scale to produce a proper Hertzsprung-Russell diagram. This is done using the distance modulus. As briefly discussed in Magnitude, absolute magnitude is a measure of an object’s brightness if that object were at a standard distance from the observer. It therefore has the same physical significance as luminosity, except the scales are represented differently: when an object is brighter, it has higher luminosity but lower absolute magnitude, and luminosity changes linearly with brightness whereas absolute magnitude changes logarithmically. There is a clear relationship between apparent and absolute magnitudes which can be understood with distance: put simply, as an object moves farther away, it appears less bright. m, the apparent magnitude, is what the object looks like from Earth, however far away it is. M is the absolute magnitude, which is what it would look like if it was 10 parsecs from Earth. 1 demonstrates apparent magnitudes: the candle and lightbulb may appear equally bright, or the bulb may even appear dimmer because it’s so far away. 2 represents their absolute magnitudes; since both lights are at the same distance, it’s clear that the bulb is brighter than the candle. where M represents the absolute magnitude, m represents the apparent magnitude, and d is the distance in parsecs. The logarithm is base 10. ?, m – M, and 5 log(d) – 5 are all what we call the distance modulus. We already have a value of m for every star that was plotted: in a color-magnitude diagram, it’s simply its position on the y-axis. But what are we supposed to do to figure out M? One method for extrapolating the absolute magnitude of a star is to look at its position on the “main sequence,” which is the stripe of stars running from upper-left to lower-right. This is because stars of the same temperature or color have approximately the same absolute magnitude, as long as they lie on the main sequence. In order to calculate the distance modulus, you need the m of a star in your cluster and the M of a similar star in a similar cluster, and you will apply those values in a process known as main sequence fitting. We’ll come back to the methods later; first it’s important to understand what an isochrone is, as you’ll be using one to find M.
An isochrone is a computational model of stellar evolution. Parameters for a cluster like its age and chemical composition are plugged into a formula, and a computer simulates the development of stars within that cluster based upon their mass. The output is similar to the results of your SQL query from the first section of this Expedition: it’s a table of numbers, where each row lists the properties of a given star. That means you can also plot this data just like you did to produce your color-magnitude diagram, and it should look like an HR diagram for a cluster of the properties you selected. Some of you may be wondering what exactly isochrones are for. They’re designed to model the internal mechanisms of stars, so we use them to test our understanding of stellar evolution by comparing their results against external (measurable) properties. This is why we don’t plot them on the mass-luminosity axes or using other relationships: we can most easily measure stars’ luminosity and temperature, which makes Hertzsprung-Russell diagrams the most efficient format to place theory alongside observation. We’ll be doing things backwards, though, since we assume that isochrones are more or less correct and use them to learn more about your cluster. An example isochrone, plotted as an HR diagram using luminosity and temperature. When producing an isochrone to match your cluster, the primary variables you need to work with are the metallicity and age. These are two parameters that every isochrone generator should require, although they may offer additional options as well. To simplify the process, feel free to do an online search for your cluster’s metallicity. The result should be a value for Z or [Fe/H], and depending on which one your generator uses, you may need to convert these values. The equation for this is [Fe/H] = log(Z/0.02), using a base-10 logarithm. As for the age, you’ll be finding that for your cluster in the next section of the activity. For now, plug in 200 million (2•10⁸) years; this should offer a relatively long main sequence to compare against. A brief online search can bring up several results for isochrone generators, typically hosted on university web domains, so feel free to explore your options before choosing which one to use. Some sites that we tested ourselves are the Dartmouth Isochrone and Luminosity Function Generator 2012 and the CMD 2.8 input form. It’s important to note, however, that models of stellar evolution are constantly being developed as we deepen our knowledge of the processes involved and our computing power improves. The generators linked to above may soon obsolesce, so research if other options have been released since the writing of this activity. When you’re interfacing with an isochrone generator, it’s easy to be overwhelmed by the number of choices available. Try to only pay attention to the variables you’re concerned with for the activity; you can probably ignore everything else. When you arrive at the page of an isochrone generator, you’re often confronted with a wall of cryptic writing and too many forms and checkboxes. It can be overwhelming at first, but once you understand what you’re doing, they aren’t so bad to work with. To begin, figure out which variables you need to give inputs for and which you can ignore. Many forms could already be filled out with default values, so if you don’t know what those values represent, it’s safest to let them be. Scan around until you find references to the age and metallicity; these are the values which you will need to manipulate and customize. If there are any other forms which the user must fill out, get creative! Do some research on the side to figure out how your decision will change the isochrone, and make an educated guess about the appropriate value. One other detail that cannot be overlooked is the photometric system: the isochrone must have data for the SDSS ugriz filters, or else it will be incompatible with your color-magnitude diagram. Is your isochrone generator flexible and user-friendly? Can you easily change some values while leaving others constant? Does the generator take advantage of current models of stellar evolution and relevant physics? Is it important to use the very latest research, or can you rely on older models which have been in use for longer? When you’ve finished inputting your parameters, export and download the generated isochrone. There may be other options available, such as luminosity functions, but you can ignore those. The output will probably be an ASCII (unformatted text) data table; the file extension could be .TXT, .DAT, or something else, but any text editor should be able to open it. Don’t be afraid to alter the file extension, either: the file’s accessibility should only increase if you change the extension from a less standard choice to something like .TXT, since more programs will be able to recognize and plot it. Recall the distance modulus as discussed at the beginning of this section. We can take advantage of this feature first by identifying the main sequence turn-off, which is where the stars plotted on the HR diagram seem to suddenly curve away from the diagonal stripe of the main sequence and instead reach upward or to the right. For now, you’ll only be working with the parts of the diagram at or below the turn-off. Imagine a curve passing through the center of your cluster’s main sequence, and record the x and y coordinates of any point on that curve–there doesn’t need to be a star at that exact location. Now you have to compare this point to the main sequence of a similar cluster with a known absolute magnitude. Specifically, you need to find the point on your isochrone’s main sequence with the same color index (x position) as the point you chose on your color-magnitude diagram, and the difference in their magnitudes corresponds to the distance modulus for your cluster. Maybe you can figure out why this works, using knowledge of star formation and lifetimes. In what ways can the spread of the data or the presence of “noise” affect the shape of the main sequence curve? How does that, in turn, affect your measured distance modulus? An important property of the distance modulus is that it’s assumed to be constant for all points on the HR diagram. This means that if you shift the y-axis by m – M, you will now have an HR diagram plotted on the absolute magnitude scale. You can also solve the distance modulus equation for d, to calculate how far away the cluster is from Earth. Try plotting your cluster’s final diagram on top of the isochrone that you used in order to ensure the main sequences line up properly. To make the plot, you’ll have to create a new data column for M. It should be in the form of M = m – ?, where m is replaced by your y-axis filter and ? is the distance modulus. To reiterate, this is a constant which is equal to the difference in magnitudes between your color-magnitude diagram and the isochrone. Now all you need to do is plot M versus your color index. A visual demonstration of measuring the distance modulus using cluster data and an isochrone. What decisions did you need to make when analyzing or interpreting data? How could these decisions have affected your final result? What are some of the risks that accompany using others’ results (metallicity, isochrones) as the basis for your own work? Did you make any mistakes while going through the process? What would you do differently in the future? Are there any steps in this activity which could be more precise? Could your results be improved by changing some of the methods? Explore some of the ideas you have and see how the changes affect your results. 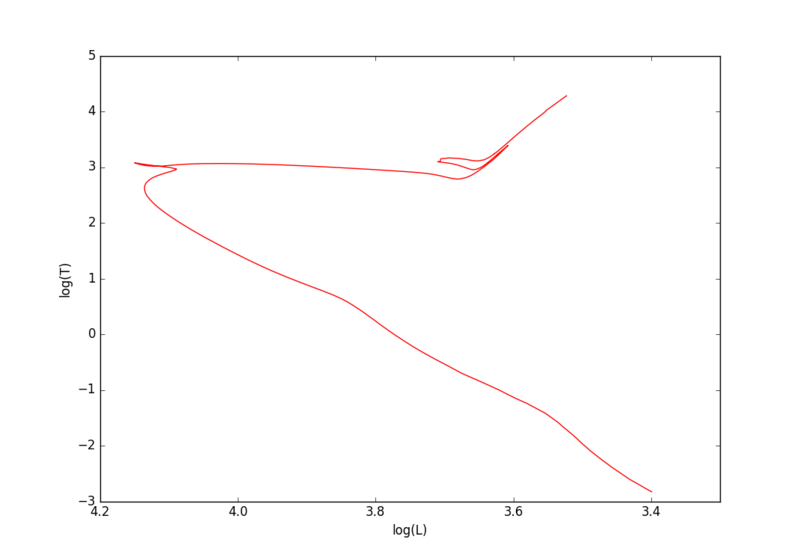 You’ve just produced a Hertzsprung-Russell diagram! Your cluster has been shifted to the absolute magnitude scale, so now what? The final section of this Expedition is focused on estimating the age of your star cluster using a process called Isochrone Fitting.